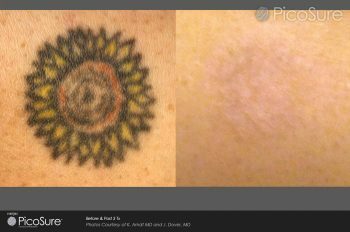 Home > Blog > What is the best Tattoo removal Laser? Having decided you no longer want your tattoo you have probably been researching what is the best method. Like us you have probably come to the conclusion that Laser tattoo removal is by far your best option but within Laser removal there are also different lasers. Here is what we found. There are some salons and DIY kits that you should absolutely avoid. They are not going to do the job and unfortunately in many awful cases people are left with horrible burn marks and scars far worse than the tattoo they were trying to remove in the first place. The standard Laser used is the Q switch machine and this works by using mainly heat to target the skin and break up the ink. It absolutely can successfully remove a tattoo but you can need 10-20 treatments for this to occur. On top of that the treatments have to be spread between 6-8 weeks apart to allow your skin to fully heal. What has most recently come out and seems to be by far the best Laser is called the PicoSure machine. It is in advance of all the Q switch machines that used to be the best thing on the market. The PicoSure machine actually uses quite a different technology. It sends out very short laser pulses that break the ink up into tiny particles to be absorbed into the blood stream and removed from your body. It also leaves the surrounding tissue untouched. The great news is that it requires way less treatments, sometimes as little as 3-5 and the gap between treatments is also less at 4-6 weeks. I hope that answers which Laser is best for you! So go get yourself booked into a clinic with PicoSure. To find out further information about the PicoSure laser, please click on this link.